Militant Bourgeois: An Existential Retreat is a project by British artist Chris Evans that became an exhibition at the Stedelijk Museum Bureau Amsterdam (smba) and an artists’ residence along the A10 in 2006. Fifteen artists accepted the challenge and confronted the primitive and unsubsidized ‘retreat’. Evans focussed on the field of tension between patronage, especially the increasingly criticized Dutch system of state subsidies, and current art production. Maxine Kopsa talked to him about anachronisms and the relation between artist and society. 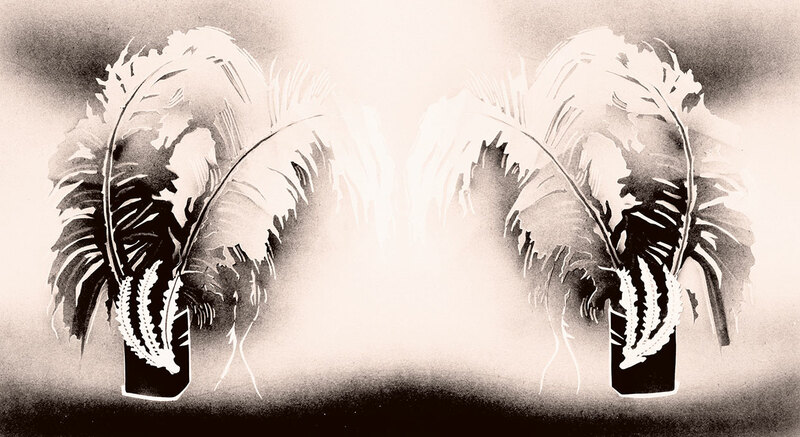 Aigrettes with Ostrich Feathers (from the Six Collection, Amsterdam), airbrush painting on paper, 60 x 26 cm, 2006 (courtesy of the artist, Galerie Juliette Jongma, Amsterdam & STORE, London). Militant Bourgeois, airbrush painting on paper, 60 x 26 cm, 2006 (courtesy of the artist, Galerie Juliette Jongma, Amsterdam & STORE, London). Any confusion I experienced during that first official studio visit was due in part to my inability to come to terms with the relationship Chris Evans sought in many of the projects with others. In the past I promised Evans not to use the term ’collaboration’ and when I do use it, it’s in a negative sence. The reason I do keep bringing it up, though slyly, is to establish the importance of the notion of ‘alliance’ in Evans’ work. 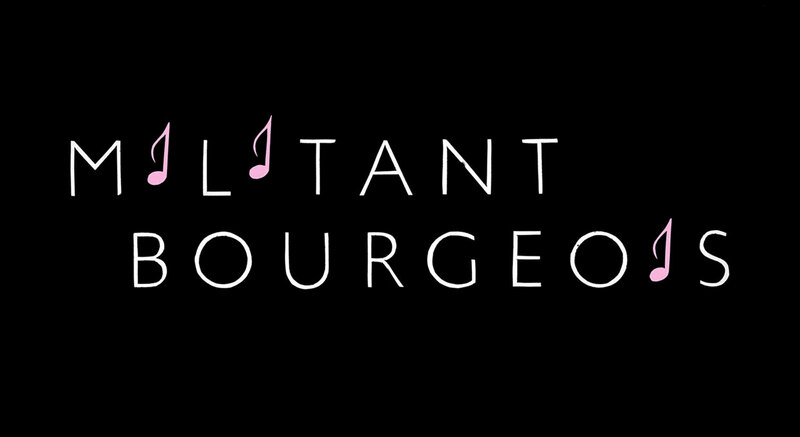 Militant Bourgeois: An Existential Retreat demonstrates this distinctive alliance. 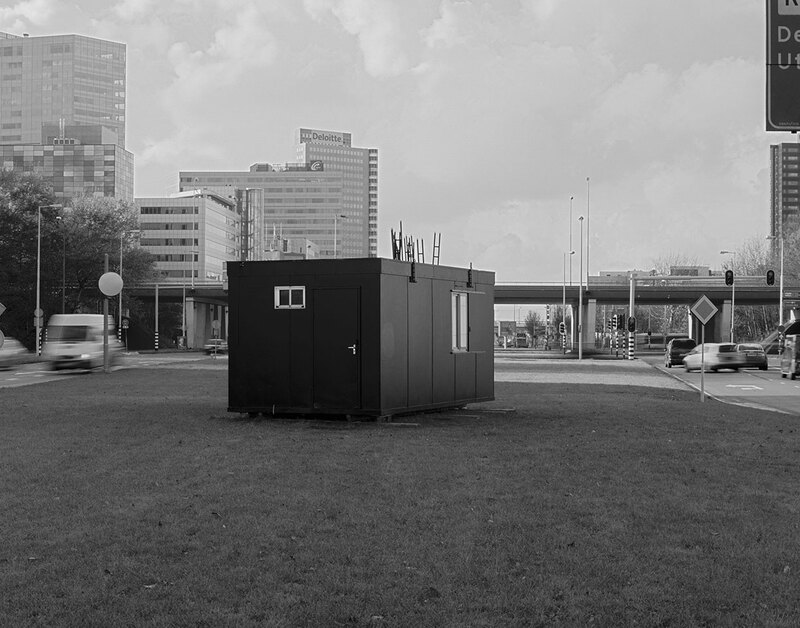 A public work in every sense of the term, Militant Bourgeois comprised a veritable retreat, albeit a black painted Portakabin, which was located at Westpoort business park, near the approach to Amsterdam’s A10 peripheral motorway. The sparse interior – the retreat was furnished with a table, one chair and a wood burning stove – reflects its stoic purpose, in Chris Evans’ words: ‘The retreat provided a boot-camp scenario for over-funded artists.’ His most ambitious project to date, Militant Bourgeois addresses topics such as power, benefaction and the myth of the solitary genius-artist, tracing these issues through history to current social artistic circumstances. The starting point was the dialogue Evans initiated with Baron Jan Six, Lord of Hillegom and director of the Six collection. Together they discussed issues of patronage, heritage, and more specifically the existentialist problems facing those born into aristocracy – the constrictions of legacy and birthright. This lead Evans not only to conceive a place of retreat open to anyone who regards themselves as an artist, but also formed the basis for a script2 and film (featuring artist Toon Verhoef as Baron Jan Six), airbrush paintings and, significantly, a wood burning stove. The elaborate design of this stove, with its flue of eleven branch-like ladders, loosely represents the eleven generations between Baron Six and his seventeenth-century forefather portrayed in Rembrandt’s Jan Six (1654) and more directly refers to the strip of golden brocade on the depicted gentleman’s cloak. Maxine Kopsa: Militant Bourgeois: An Existential Retreat is a large-scale project, involving various stages of development and exceedingly distinct (visual) elements. It is both an abstract and aesthetic translation of a concept (in a series of exhibitions) and its literal rendition (the retreat itself). Are you forcing an enquiry into ‘making’ in general, its history and its moral (or ethical) position in our current society? Chris Evans: The Retreat is not an attempt to solve social impasses or stake a claim in rewriting existential theories. It’s not an altruistic community growth endeavour. A manipulated constellation of power relationships mangled with the ethics of aesthetics would be how I’d want people to see it. Manipulation aside, the open call to participate in the retreat’s residency programme was genuine. Who ultimately reacted? The retreat was publicized by a poster campaign around the city. A whole range of artists applied – from those working in relative obscurity to others more prominent in their practice. How did you formulate the invitation? The form that people filled in said very little, it presumed that artists had heard about or seen the first stage of the artwork at the Stedelijk Museum Bureau Amsterdam. You said before the retreat had opened that it might not be important that anyone visited it. And you compared the whole mechanism of you making the retreat, or as you put it, ‘setting things up in order to create a situation’, to Derrida’s notion of the gift, which in short revolves around the idea that ‘for the gift to be received as a gift, it must not appear as such, since its mere appearance as gift puts it in the cycle of repayment and debt’. Can you explain the retreat’s relation to this idea of ‘gift’? You mention the Dutch state’s relationship to artists – and, indeed, I always thought the retreat was specifically developed for the Netherlands, but seeing as it is now opening at the International Project Space in Birmingham, are its aims and implications the same, wherever it may be? When I did the show at smba in June of last year, it was before the retreat opened. I wasn’t interested in doing a public artwork unless the elements of the work leading up to it were shown. At smba the posters advertising the retreat were painted as part of a trompe l’oeil of an entire exterior wall, it wasn’t clear whether the whole thing was fictional or not until the real posters went up a few weeks later. So at International Project Space in Birmingham (ips) – now that the retreat has closed – it will read more like a documentational show. Yet the issues surrounding the whole thing prevail: in what way who is funding the work, be it the state or the market, influences what gets made. But are you still discussing the Dutch funding situation? The work implies that overly generous subsidies to artists in the Netherlands make for lazy art and that an Existential Retreat, where artists are taken out of this cozy situation, is necessary. The uk doesn’t have such generous funding, nevertheless the state is behind a lot of work that does get made – call it state sanctioned subversion. I think it’s supposed to be a sign of a strong democracy when the state allows its citizens to be critical. Anyway, I hope the work at ips will draw comparisons with the patronage situation between the Netherlands and the uk, and question in what way that affects the art that gets made. You haven’t relocated the actual retreat. Why not? Where is it now? I don’t think the uk needs the retreat. 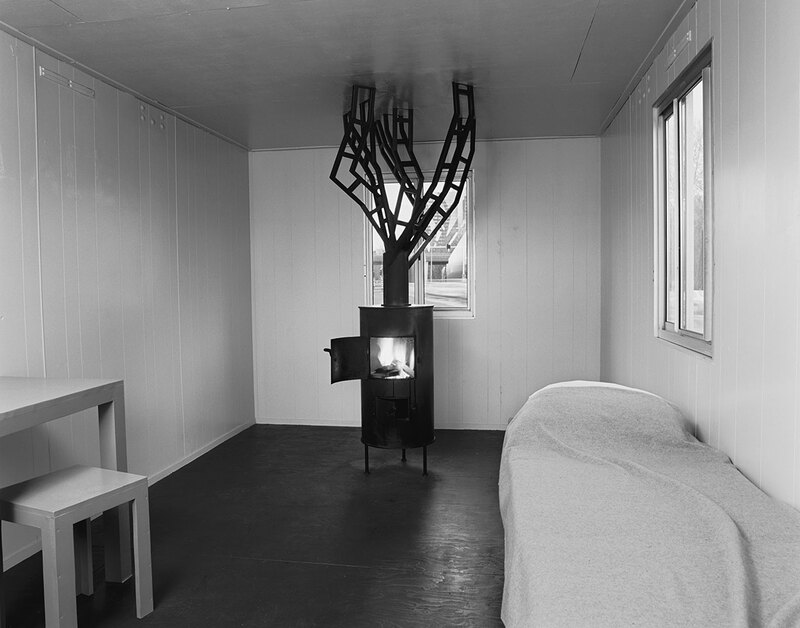 The retreat was dismantled – the wood-burning stove is all that is exhibited from the place itself. How can you see the influence of the funding agent in a work? Can I see it in yours, for example? From the third-hand ‘transcendental’ modernism of much corporate sculpture (strong and upward looking to echo the ethos of companies) to work that’s doing the social work for the state (socially engaged pro-inclusive art) to the work that will fit neatly on a collector’s wall. But then this all sounds a bit bleak doesn’t it – and it’s forgetting all the art that gets produced with intent that’s irrespective of all of this. With work I make, where the patronage situation is relevant to what I’m setting out to do, I take the ‘funding’ out of the equation to see how this changes the dynamic. It supposes that I get the upper hand though often, conversely, shows that I might not have the last say… that I might not have the last laugh. Is it wrong to be funded? Or, put differently, is there such thing as a ‘healthier’ funding agent? I like it when my gallerists buy me drinks – compared to smba trying to put me up in an anti-squat to save money! Needless to say there are inherent obligations in any kind of patronage relationship. If you would have to choose your personal patron (read: grant-giver), would he be from the political arena or the private sector? I’ve found things to move faster when working with the private sector, you don’t get bogged down with institutional bureaucracy. I would, however, be happy to get bogged down in red-tape if a Dutch funding organization took on the building of Radical Loyalty – my sculpture park in Estonia. Are you truly interested in the ‘patron’ you select to work with? Do they ever become in some way or at some point interchangeable? I’m very specific about whom I choose to work with and I don’t think they are interchangeable. The background behind the director of Starbucks uk is a million miles away from that of a Bangladeshi Supreme Court Judge. The latter, Refaat Syed Ahmed has, in the past couple of years, suffered the assassination of both a member of his family and a close colleague. Nevertheless, and contrary to the easy cliché of power = corruption, his family is regarded as ‘clean’ in a country where few elite factions are regarded as such. Meanwhile, as the director of Starbucks uk, Cliff Burrows’ concerns are likely to lie in how many Starbucks he can open on a single street and sustaining staff and customer loyalty – which, since that’s his job, is fine. He, like Syed Refaat Ahmed, is acutely intelligent – they are aware of the need to confound people’s ready-made judgments of their positions. If Cliff Burrows sincerely believes in Adam Smith’s ‘harmony of interests’ (a scenario where private economic interests conduce to the moral and general good), then let’s see how this stands up in the form of a sculpture, built by artists who formally built Soviet monuments, and in a country – Estonia – which is at that critical moment of opening its doors to global corporations and the ‘open’ market. For Le Nouveau Siècle guest curated by Xander Karksens at Museum van Loon in Amsterdam, you worked closely with the host – or you might say patron – of the exhibition. Could you tell me about the piece? It’s a small ceramic titled A Sculpture for Philippa Van Loon, The Other Statue (after E. Gorey). The sculpture I made resembles part of an illustration from an Edward Gorey book called The Other Statue in which there are macabre and somewhat mordant occurrences at an aristocrat’s stately home. In Gorey’s illustration, a fragment from a fallen sculpture – a hand and what appears to be the end of a crutch – is lying on the ground in front of the stately home and one of the visitors lies dead, out of the picture. It is perhaps as if the sculptures of the estate are seeking revenge on their patrons. The gesture of the hand in the work I made differs from that in Edward Gorey’s illustration. It is copied from a drawing given to me by Philippa Van Loon, following our conversation about how she felt growing up as a member of one of Holland’s best known aristocratic families in the ‘ivory tower’ surroundings of a museum ­– the historical family home. She intended the gesture of the hand to be, in her words ‘not a fist, but to have the constriction and muscle tension that is similar, yet also a gesture of still being able to look through into an opening – restrictive yet with a passage through’. It made me think about an estate owner’s reply to the vengeful sculpture in Gorey’s book. Does working with a patron ever feel like a restriction, what with the appointments, the potential for misunderstanding and effort spent avoiding it? Yes. It often feels like going for a job interview, having to gain people’s trust and then creating a situation in which they feel comfortable in telling me their thoughts, etcetera. Nevertheless, it does heighten the need for me to come out with something tangible from a meeting, something I can build on. I rarely get that from sitting in front of Google. With the latest piece of work I’m making – a film and sculpture called The Freedom of Negative Expression – there’s a break from previous strategies in that one of the two characters – a well-heeled nihilist – is entirely fictional and the other is loosely based on a surviving member of the British Constructivists. Having met her in Paris (she wishes to remain anonymous) I realized, after the eighth drink, that there was no way in which we were going to be able to directly work together. Given the amount of work that goes into the production and realization of each project, how important is the final, physical outcome in relation to the process? The object-nature of my work is also how I effect the tone and the pace of how things fit together, so with A Sculpture for the Ahmed Family I wanted the sculpture to deflate the bombastic, heavy subject matter. With The Rock & The Judge series I want my ‘rocks’ (which I see as a ‘default’ for ‘sculpture’ – in terms of subject matter and form) to appear quiet and passive – despite them standing in for the defendants. The drawings of the judges are by policemen and – given the often tense relationship between these two closely linked yet separate occupations, you’re always going to get an interesting drawing from a policeman if you ask them to draw judges. You teach quite regularly and have done so in the past, you’ve even taught as work in itself (Free Tutorials, 1999). Do you see teaching as a kind of service or, possibly, continuing the Derrida reference, as a form of gift giving? I only do a few days at Leeds University now and I get angry at the ineptitude of the place. Free Tutorials was a reaction to this ineptitude. I’m currently thinking it’s best if I let students learn for themselves and so I encourage a mindset where they feel confident to take down their defenses. Free Tutorials was an All Horizons Club artwork – when you were working with Padraig Timoney and Duncan Hamilton. You and 18 artists traveled around in a minibus for two months visiting various uk art colleges – uninvited. Was the situation in the uk arts educational system so dire that you felt the need for such a radical mercy mission? Yes, absolutely, though I value the possibility of non-vocational study, and the importance of art schools – it is because of this that we did Free Tutorials. I don’t know if art schools in the uk have changed over the last eight years since we did Free Tutorials. I did a day at Goldsmiths last week and there are three artists per tiny studio when, prior to this year, it used to be two. I guess that tells us something. Is it necessary for teaching to be a clandestine form of gift giving? I’m very confused about what art school teaching should be. Frankly I’d rather not work in these environments at under-graduate level until I’ve begun to fathom what my role could / should be if any at all. I’m worried that what I do could actually be a hindrance. If you could choose just one, what’s the most important thing you could possibly want your student to learn from you? Sorry if I’m sounding like a hippy here but it should be about what they can learn for themselves. Late in 2005 you organized a ‘workshop’ (or should I call it a show?) at Store, your gallery in London, where you invited art experts to be available for consultation. The one-day event (or should I call it piece?) was called Is My Work Too Commercial? and involved ‘tutors’ giving advice to any artist concerned their work being too commercial and the adverse effect this may have on their practice. Should I see this work as an altruistic service? How serious a person are you? Dramatically, yes. Are you asking if there’s humour in the work? For Cop Talk I’m serious in my intent in giving art students the opportunity to join the police force, though when people see the poster I guess they might think otherwise. Maybe this is a problem with the piece, though I enjoyed doing the airbrush poster for it. For this I researched Dutch police cars, looking for the best car they have in their arsenal. Since they don’t manufacture cars in Holland they opted for the Italian built Lamborghini Countach. It’s an extremely fast car and so good for chases. Unfortunately it has doors that swing slowly upwards. I like to imagine the Dutch Police catching a criminal on the motorway but unable to get out of their car fast enough to make the arrest… That’s now one potentially humorous anecdote lying dead on the page. I don’t know where to begin trying to talk about humour. As for ‘irony’ I cringe when I hear that word. It’s such a catch-all term that it closes off more interesting ways of approaching something. 1. In 2002 Chris Evans purchased a piece of land in the industrial town of Järvakandi, Estonia with the intention of creating a sculpture park. He also began interviewing numerous managing directors from various international companies, from the corporate sectors of retail, telecommunication, energy and advertising. He discussed with them how they felt about loyalty, whether their standpoint was radical and together they developed these ideas into drawings (most now an engraving and one, a bronze maquette) of three dimensional objects. The idea is to use these visualizations as plans for life-size sculptures produced by a collective of Estonian artists (responsible for building the country’s monuments during the era of Soviet occupation) Evans hired to create the sculpture park. The Järvakandi sculpture park thus becomes the sculpture park of this alliance of CEOs, initiated, then assembled and translated by Chris Evans. 2. The script is based on an ‘Existentialist narrative’ by the philosopher Nina Power, commissioned by Evans. It was further developed into the film script by Evans and the writer Will Bradley. 3. As the critic and art historian Michael Baxandall wrote: every artwork ‘is the deposit of a social relationship’. Maxine Kopsa lives in Amsterdam. She is a freelance writer, curator and editor of Metropolis M.